There are numerous benefits to the open source nature of .NET Core. One specific benefit is the ability to look at how teams organize folders, projects, and files. You’ll see common conventions in the layout across the official.NET Core and ASP.NET Core repositories. A src folder, where all projects will live in sub-folders. Having a VS solution file in the root makes it easy for VS developers to clone a repo and open the file to get started. I'll also point out that these repository layout conventions existed in other ecosystems long before .NET Core came along. In upcoming posts I’ll share some additional folders I like to see in every repository. Recently I had the opportunity to review the Microsoft Azure compliance offerings and certifications. I did this because some customers want to see proof that Microsoft isn’t running a datacenter out of a 3-car garage in Kirkland. Compliance docs are difficult to wade through, so while researching I decided I would also binge-watch early seasons of Parts Unknown. Every time I came across the phrase 'policies and process' or a sentence with more than 3 acronyms inside, I could pause and watch chef Bourdain eat tripe stew in an abandoned bomb shelter. There might never be another show like it. Azure maintains compliance with numerous global, regional, and industry-specific requirements. The Compliance Offerings page is a good starting point to find a specific standard. One thing to keep in mind is that a standard, requirement, or statement of compliance doesn’t necessarily apply to all of Azure or Microsoft. Microsoft will clearly state the services and products covered by a certification. Some certifications will cover all of Azure, while others might cover a specific product (Office 365 only), or a specific region (Azure US Government or Azure Germany), or a subset of platforms in Azure (Storage and App Services, for example). Here’s a list of my Azure favorites. Keep in mind I do a bit of work in the U.S. healthcare industry. ISO 27001 - Compliance with this family of standards demonstrates that Azure follows industry best practices in the policies, procedures, and technical controls for information security. HIPPA and the HITECH Act - Azure has enabled the physical, technical, and administrative safeguards required by HIPAA and the HITECH Act inside specific services. Microsoft offers a HIPAA BAA as part of the Microsoft Online Services Terms. HITRUST – the Health Information Trust Alliance maintains a certifiable framework to help healthcare organizations demonstrate their security and compliance. FedRAMP – Azure offers various compliance offerings for the U.S. Government, including DoD (DISA SRG Level 2, 4, 5) and CMS (MARS-E) specific offerings. In general, these certifications allow federal government and DoD contractors to process, store, and transmit government data. FedRAMP itself is an assessment and authorization process for U.S. federal agencies to facilitate cloud computing. I worked on a .NET Core console application last week, and here are a few tips I want to pass along. The basic concepts are Options, Arguments, and Commands. The McMaster package, which was forked from an ASP.NET Core related repository, takes care of populating properties with values the user provides in the command line arguments, as well as displaying help text. You can read more about the behavior in the docs. Running the app and asking for help provides some nicely formatted documentation. The ServiceProvider we’ve learned to use in ASP.NET Core is also available in console applications. Here’s the code to configure services and launch an application that can accept the configured services in a constructor. In this code, the class Application needs an OnExecute method. I like to separate the Program class (with the Main entry-point method) from the Application class that has Options, Arguments, and OnExecute. I’ve been porting a service from .NET to .NET Core. Part of the work is re-writing the Azure Service Bus code for .NET Core. The original Service Bus API lives in the NuGet package WindowsAzure.ServiceBus, but that package needs the full .NET framework. The newer .NET Standard package is Microsoft.Azure.ServiceBus. The idea of this post is to look at the changes in the APIs with a critical eye. There are a few things we can learn about the new world of .NET Core. The old way to construct a QueueClient was to use a static method on the QueueClient class itself. The new style uses new with a constructor. ASPNET core, with its service provider and dependency injection built-in, avoids APIs that use static types and static members. There is no more HttpContext.Current, for example. Avoiding statics is good, but I’ll make an exception for using static methods instead of constructors in some situations. When a type like QueueClient has several overloads for the constructor, each for a different purpose, the overloads become disjointed and confusing. Constructors are nameless methods, while static factory methods provide a name and a context for how an object comes to life. In other words, QueueClient.CreateFromConnectionString is easier to read and easier to find compared to examining parameters in the various overloads for the QueueClient constructor. The old API offered both synchronous and asynchronous operations for sending and receiving messages. The new API is async only, which is perfectly acceptable in today's world where even the Main method can be async. The old queue client offered a BrokeredMessage type to encapsulate messages on the bus. Behind the scenes, BrokeredMessage would use a DataContractBinarySerializer to convert the payload into bytes. Originally there were no plans to offer any type of binary serialization in .NET Core. While binary serialization can offer benefits for type fidelity and performance, binary serialization also comes with compatibility headaches and attack vectors. While this hidden serialization magic is convenient, applications should take explicit control of object serialization and turn their object graphs into streams before including them into a message, and do the reverse on the receiver side. This yields interoperable results. Interoperability is good, and the API change certainly pushes developers into the pit of success, which is also a general theme for .NET Core APIs. I’ve been mixing up my browser usage over the last year to give MS Edge a closer look. Some pages are noticeably slower in Edge. 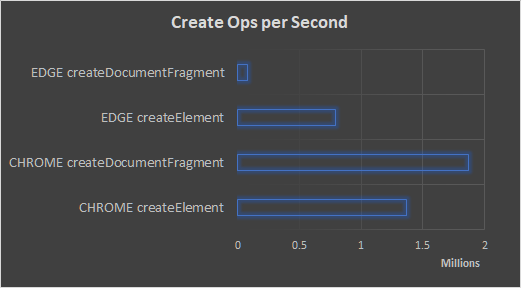 Looking in the developer tools, the slow pages have thousands of calls to createElement and createDocumentFragment, so I thought it would be interesting to do some microbenchmarks. With today's stable releases, createElement is twice as fast on Chrome, while createDocumentFragment is an order of magnitude faster. In my Developing with Node.js on Azure course I show how to setup a Git repository in an Azure App Service. 3. Run npm install in the web site directory. After these steps, most Node.js applications are ready to start. A common set of questions I hear revolve around how to change the deployment script to add additional simple steps. Perhaps the project needs to run a transpiler or a tool like Webpack before the application can start. You can write your own script from scratch or copy and modify the script from Azure. I'd suggest starting by looking at the script Azure generates first. 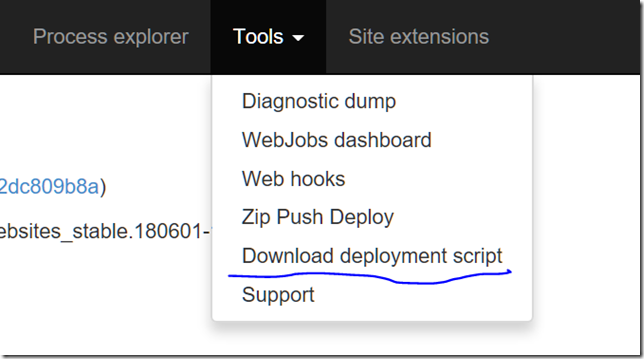 Go to the Kudu website for the app service and select "Download deployment script" under the Tools menu. "build": "webpack --mode production --config webpack.config.js"
One advantage to this approach is the ability to skip installing webpack as a global dependency. Instead, npm will search the node_modules/.bin folder for tools like webpack, grunt, gulp, and tsc. Although you can install tools globally in an app service plan, I tend to avoid global tools when possible and thunk through project.json instead. You can now override Azure’s deployment script with your custom script by checking the script into your source code repository. * Note the deployment script only uses the 2nd step if the App Service is Windows based. Otherwise the underlying container sets the Node.js version.